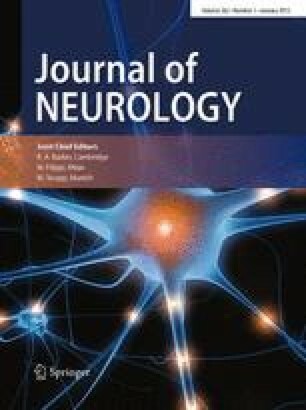 To determine whether there are characteristic changes in event-related potentials (ERPs) in parkinsonian syndromes we studied 8 patients with progressive supranuclear palsy (PSP), 10 patients with corticobasal degeneration (CBD), 9 patients with striatonigral degeneration (SND), and 16 patients with idiopathic Parkinson's disease (PD) with a mean duration of illness shorter than 5 years in each group. A visual oddball paradigm was employed to elicit P300. P300 to the rare target and rare nontarget stimuli and reaction time (RT) to rare target stimuli in each group were compared with those in the corresponding age-matched normal control group and to each other after age correction. The correlation of P300 and RT to motor disability score was also studied. In PSP P300 amplitude was markedly reduced while in CBD P300 latency was prolonged. P300 amplitude to rare nontargets in SND and PD was attenuated. The mean RT in the PSP and the CBD group was significantly longer than in the other two groups. The mean RT in PD and P300 amplitude to rare nontargets in both CBD and PD showed significant correlation with the severity of motor disability. Simultaneous measurement of P300 and RT may yield useful supplementary information in facilitating diagnosis of parkinsonian syndromes in addition to clinical criteria.